I wrote in one of the earlier entries how I could lay hand on only a small note book the Anand’s house in Cary, NC that had a tag of ‘Made in India’. 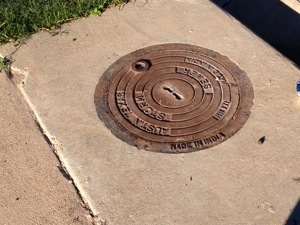 While in Austin, one day during my morning walk I discovered a good number of manhole covers that have been sourced from India with ‘Made in India’ tag. And while writing this, I came another item with a ‘Made in India’ tag. 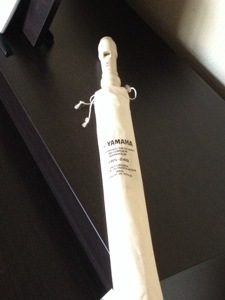 The cover shown below of an Yamaha flute bears the tag of ‘Made in India’ for the cover. Wherever I have gone for shopping with Anand in Cary or with Rajesh in Austin, or earlier in New York or places in California earlier, be it big retail shops of Walmart, Target, Macy’s or the seasonal shops selling items for Halloween, or outlets of Home Depot or Bath, Bed and Beyond, I find the overwhelming presence of household products sourced not only from China but also from many developing countries including Southeast Asian countries and South American or African countries. The presence of ‘Made in India’ has been just rare. Why are Indian manufacturers so visibly absent from American market? Though only few in India dares to enter in manufacturing enterprises, but there are exceptions too. Many have succeeded in making a breakthrough.Mithun Chittilappilly had taken V-Guard Industries, an electrical appliances manufacturing company founded by his father Kochouseph Chittilappilly in 1977, to a new height. 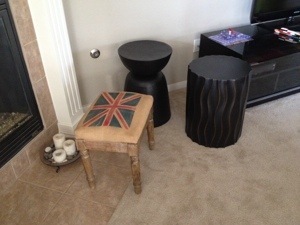 Some though small have gone even global. Even big business houses are diversifying in high tech manufacturing and even in defence production, though the PSUs such as HAL are not gearing itself to its user requirements. It is really interesting read a news report. “Several containers of packaged food products carrying imported chocolates, crispies, gourmet cheese, olive oil, biscuits, noodles, pasta, jams, honey, oats and sauces, etc, have been recently blocked at various ports and airports across the country, in the absence of a clearance from FSSAI. About 50-55 per cent of packaged food imports in India happen during the festive season, since it is utilised mainly for gifting, apart from consumption.Government sources indicate packaged foods worth Rs 750-1,000 crore was stuck at various ports and airports across the country.” With a critical CAD (Current Account Deficit), are such imports justified? Unfortunately, in the name of free market the government has become so liberal for importing almost everything and has forgotten the old policy of phased local manufacturing policy that the Chinese pursued to get into manufacturing sector in big way. India needs more and more industrialists and entrepreneurs of the breed of Brijmohan Lall Munjal and Anand Mahindra.